Q Acoustics announces high-end Concept 500 speakers | What Hi-Fi? The £3600 premium floorstanders are a departure from the rest of the brand's more affordable line up, and offer new drivers and cabinet improvements. After previewing it quietly at the Munich Show earlier this year, Q Acoustics has officially announced its first high-end loudspeaker, the Concept 500. They will cost £3600 a pair. That’s some move away from the company’s previously more budget focus – and it's a step, Q Acoustics says, towards it becoming a more full-range loudspeaker supplier. Featuring two newly designed low-distortion 16.5cm mid/bass drive units and a new 28mm soft-dome tweeter with wide surround, the stylish Concept 500 has been built from the ground up, with the cabinets in particular receiving some significant improvements to help improve sound. For example, they benefit from Dual Gelcore technology – an idea similar to that used in the five-star Concept 20 and Concept 40 speakers (£1000), but this time offering three layers of MDF rather than two, making it even more effective. It works by sandwiching each layer of MDF with a flexible gel that absorbs any vibrations and turns them into heat. Q Acoustics says this, combined with stiffer Point to Point bracing, reduces unwanted noise from the cabinet by 30dB, improving stereo image and reducing colouration, making music sound more natural as a result. Helmholtz Pressure Equalisers further help sound purity by equalising the pressure differences caused by a tall loudspeaker cabinet, while the stylish aluminium plinth works to ensure as little acoustic reflection as possible. The two 16.5cm mid/bass units sit in a newly designed rubber surround and promise plenty of power from their relatively small dimensions thanks to a large 35mm glass-fibre voice coil. The 28mm tweeter is mechanically decoupled and mounted in its own rubber gasket to isolate it from vibrations, and is claimed to offer a significantly wider sweet spot thanks to a good off-axis response. You're also able to tweak the high frequency response by +/- 0.5dB to suit your room and tastes. Combining all of this is a Linkwitz-Riley crossover that comprises a Mundorf Supreme polypropylene capacitor in the tweeter feed paired with a large 10x10cm Mundorf air-core inductor, so big it needs to be mounted in the base of the speaker. As for design, the Concept looks every bit a Q Acoustics product, but with some stylish new tweaks. From the front, the clean, contemporary look doesn’t differ much from any of the company’s other floorstanding designs - it's available in the standard gloss white or black. Take a look to the side though, and you’ll see a wooden veneer section mounted to the back of the speaker, available in rose wood for the black or light oak for the white. It’s a stylish finish and gives these bi-wireable speakers a bit of flare to stand out from the rest of the company’s more affordable line-up. 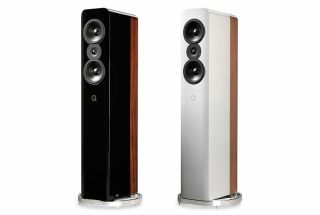 As with all Q Acoustics products, Karl-Heinz Fink has tuned the Concept 500s, in an aim to keep a consistent family sound. The Q Acoustics Concept 500 speakers will be available in February 2017.